Long before Houdini was The Handcuff King, he was The King of Cards. No doubt a moniker that he gave himself, rather than one which was awarded him. But it has always made me wonder, what was IN this card act of his? So I decided to try and delve into what Houdini might have done in this act. After extensive research, the last book I looked at was Pat Culliton's HOUDINI: The Key. This book has a rather large section on Houdini's card work, and also has a lot of the references I dug up on my own. Had I been home at the time, his book would have been my first book to check. I would encourage you to check out Pat's book, as he describes many of the 'moves' or sleights in detail, that I am going mention, but glance over. Pat did an incredible job describing the card work of Houdini, but I still have material to add! Let me start by saying I believe Houdini falls into the category of card manipulator rather than what we think of today as a cardician. HOUDINI's Fabulous Magic by Walter Gibson, confirmed my suspicion of Houdini's card act. Here is an excerpt, "Being a showman, he aimed for the spectacular in his card work, so while he was well versed in more subtle sleights, he stressed card flourishes in his public performances." It's very clear by viewing existing video of Houdini presenting card flourishes that the man had skills! There are some moves he was known to do that seem impossible today, this to me is thrilling! 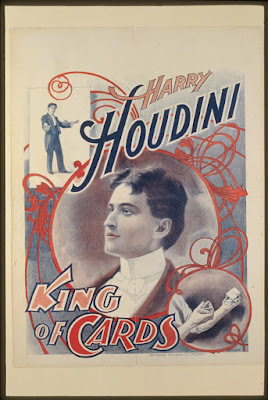 Let's begin with Houdini's King of Cards Poster. This poster was made in 1895, and was produced by the National Printing and Engraving Company of Chicago. Though it has been reproduced numerous times by different sources, I had heard the original is fairly scarce. 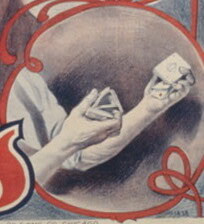 In the upper left hand corner we see Houdini executing a technique called 'Ribbon Spreading on the Arm'. The effect of the flourish is this, cards are spread over the forearm, which is held in a horizontal position. The cards go from the bend of the arm right to the fingers. By bending the fingers, you can cause the cards to all turn over. The effect can end there, or the magician can use the other hand to push the cards forward and remove them from the arm. 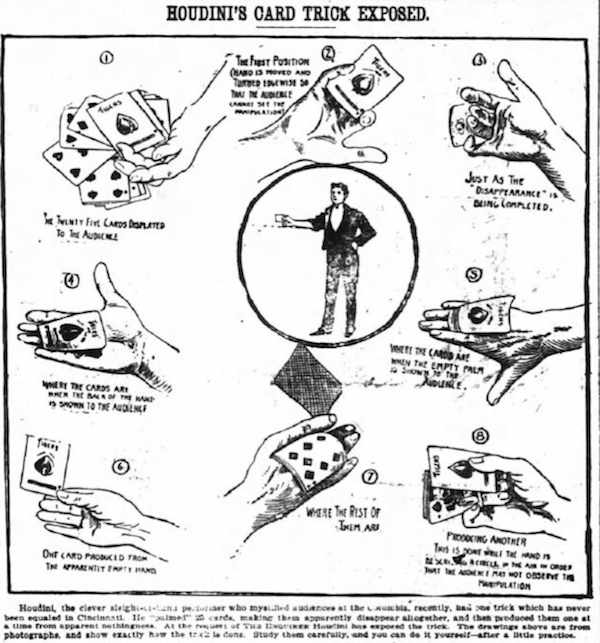 Or in a more grandiose move the magician can jerk for the forearm upwards slightly causing the entire spread of cards to come off the arm slightly, then in rapid succession, the opposite hand pushed the 'floating spread' back together and catches all the cards in one hand, all while the cards are 'in the air'. It looks more impressive than it reads. On the poster, Houdini is doing the move with both arms at the same time. Is this possible? 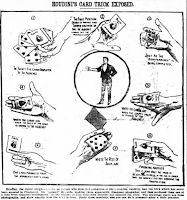 Pat Culliton in his book HOUDINI: The Key, has the likely solution to the image and that was that Houdini had an assistant who could spread the cards on the other arm before Houdini began his manipulations. However, I would not put it past Houdini to be able to accomplish this on his own. Houdini had one other twist with the 'spreading on the arm move'. This fortunately has been captured on video for posterity, he would spread the cards on the back of the arm, and then with an upward jerk cause the cards to rise above his arm slightly, about two inches or so. He would then rotate his forearm to the other side and recatch the cards on his arm. There is a move related to the 'Spreading of Cards on the Arm' and that is when you take one or two or three packs of cards and place them on the arm and catch them in succession, one after the other, after having thrown them into the air. The fact that Houdini presented this feat was revealed in Magic Without Apparatus by Camille Gaultier. Next, the lower right hand image on the poster has Houdini doing fancy one handed cuts, one in each hand. The one handed cuts that Houdini demonstrates may just be his own creation. There are numerous one handed cuts like the Charlier Pass and the One Handed Swing Cut, and today with the explosion of 'Card Artistry' I would imagine there may be a hundred different ways to cut cards in one hand. But the Houdini method seems to be his own. If anyone has information to the contrary, please let me know and I will gladly correct this part. An interesting point about the original photograph that this illustration was made from is that the words 'King of Cards' are written right below his hands. I should also point out, that Houdini is doing these cuts at the same time in both hands! That is impressive! This took place in 1895, so no doubt he had a couple years of hard work and dedication put into learning these difficult flourishes. In the period between 1896-1897, when Harry and Bess were doing just about anything to stay in show business, Houdini actually performed an entire act as CARDO-King of Cards. This came as a surprise to me when I first read it. But I must have seen it in print numerous times in the past and it never sunk in. 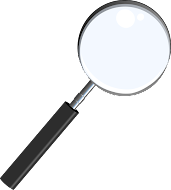 'CARDO' is mentioned in the Silverman biography, in the Kalush biography, in the Randi/Sugar biography and also in Masters of Mystery, page 40. The original source of the Cardo reference comes from a letter from Bess to Sir Arthur Conan Doyle dates December 16, 1926. This document is housed in the Harry Ransom Center. But there is an even earlier reference to CARDO which comes from the Kellock biography, that has Erich Weiss using the name at 15 years of age, before he was HOUDINI. HOUDINI's Fabulous Magic tips another exciting flourish from Houdini's card act and that was his Card Scaling or Boomerang Card routine. He had two versions that he could present and both are quite impressive. Both involved tossing/spinning a high into the air and having it return like a boomarang. In one version the card would return to the deck. Walter Gibson points out in Houdini's version, he would open the cards like a one handed as the spinning card returned to the deck! But I think I like the other version better. Houdini would scale the card in the air as before, but upon return he would pick up a large pair of scissors and cut the returning card in half. This very effect was presented by Ricky Jay in his show Ricky Jay and His 52 Assistants. The next flourish from Houdini's act is his 'Back and Front Palm routine'. For a long time I had heard this move was credited to Dr. James Elliott. Knowing Houdini wrote the book Elliott's Last Legacy, I decided to check that book out to see what interesting tidbits might be found within. Houdini states that both he and Dr. Elliott both learned the move from magic dealer Otto Maurer. He also reveals in the introduction to the book that his dime museum work is where he passed his 'college of experience' and would often have a deck of cards in his hands from 10am to 10pm. He would present 9 to 14 shows in a day, but during Christmas and New Years, actually gave 44 shows, each lasting only ten minutes each. Among that ten minutes was his routine with the 'front and back palm'. Houdini claimed that his ability to do the 'forward and back palm' with 32 cards is what gained him the title of 'King of Cards'. He also apparently at some time claimed to have originated it, but again, he himself revealed that he learned it from Otto Maurer in the 1890s. But by 1899, it appears Houdini was done with the move. In fact, for the time he was done with cards altogether. In the December 24th, 1899 edition of The Cincinnati Enquirer there is a large illustration titled, "Houdini's Card Trick Exposed". And it was Houdini himself who posed for the photos that were used to do the exposure! (Thanks to both Pat Culliton and Chuck Romano for finding this article). Oh, why would Houdini expose this trick you ask? Earlier in the year, Houdini would meet Martin Beck who would tell Houdini he could book him into the Orpheum circuit if he would drop the magic and just do the escapes and the Metamorphosis. So by Dec 1899, Houdini had no need for cards. Though, he would bring them back in 1925. More proof Houdini was done with cards, is this expose on Card Cheating by Houdini, that appeared in another newspaper. In this article Houdini is called 'the noted Austrian sleight of hand artist'. This is from the Akron Daily Democrat, July 8, 1899. I'd like to stick with the material that Houdini used in his stage Card Act. However, given that there are a number of references to Houdini's card work (close-up style) in other books, I want to include those here also. On page 94 of The Art of Magic by T. Nelson Downs, he describes Houdini's Torn Card Trick. This trick also appears in Magic Without Apparatus by Camille Gaultier. In addition, the latter book also contains Houdini's Pass. There is also reference to Houdini's Flourish Routine. However, despite my best efforts I can't actually find anything in the text that says 'Houdini's Flourish Routine'. I have the digital edition of the book and it links to the page with the Ribbon Spread On the Arm. This is clearly 'part' of Houdini's Flourish Act, but not the entire thing. One Houdini Flourish that Gaultier does mention is really out of this world. It's the Springing of Cards, but done with one hand rather than two. I'm having a hard time imagining such a thing. In HOUDINI The Key, there is a slow motion image of Leslie P. Guest demonstrating the One Handed Spring. There were people who witnessed Houdini doing it. So it must be a real thing! In Elliott's Last Legacy by Houdini, he again includes his Houdini Pass. But you'll also find two other sleights by Houdini. One of them is his take on the Top Change and the other is a clever Color Change which might possibly have been included in his manipulation act. In HOUDINI The Key, Pat Culliton describes Houdini's Self-Extracating Card as well as a Card Stabbing routine that first appeared in the October 7th, 1899 edition of The Denver Times. Finally, in the Sphinx May 1909 there is an article by Dr. James Elliott on The Frazier Card Pass. It is Elliott's belief that the Houdini Card Pass is the same as the Frazier Card Pass. 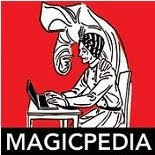 Getting back now to Houdini's King of Cards Act, I did find a very cool reference to Houdini's Giant Card Star on page 152 of Houdini's Fabulous Magic by Walter Gibson. Gibson describes the Houdini Giant Card Star and why it was so amazing, as opposed to the standard Card Star which had fallen out of favor in the 1880s. 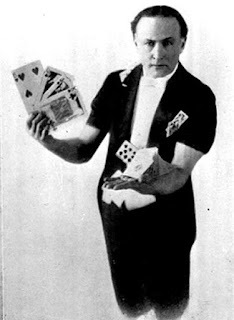 In the Houdini Giant Card Star, Houdini would show a jumbo deck of cards and then several cards were named by members of the audience. The Card Star was then hung by ribbons on the stage. Then Houdini would throw the jumbo cards at the card star and the 5 selected cards would instantly appear on the five points of the star. Why is this different from the standard card star? The introduction of the Jumbo Cards which were 4 times as big as a regular deck of cards. When they appeared on the five points of the star they were so large it was impossible to figure out where they came from. From what Walter Gibson had to say, this trick even fooled the magicians of the day. On page 155, there is a photo of Douglas Geoffrey (Hardeen Jr) holding Houdini's Card Star. And truthfully, if you know how the standard Card Star works, the image of the Houdini version seems impossible. Incidentally, my interest in this subject began when I read about a card routine Houdini had in his notes called Half in Half. 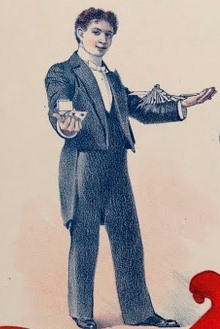 The routine appears in Houdini's Magic by Walter Gibson. The routine is an unusual card to pocket sort of routine, and after having tried it out on a live audience, I can attest to it's strength. After this, I wanted to see what else Houdini did in the cards department and that is when I realized I didn't really know what his 'King of Cards' act consisted of. Clinton Burgess pretty much wrote Elliot's Last Legacy. Harry claimed that it was in such poor shape that Eugene Powell had to rewrite certain portions. Burgess was furious that HH had hijacked the book and put his name on it. Harry also kept some card manipulations in his handcuff act when he debuted at the Alhambra in London 1900. Thank you for your input. I knew some of the details of the Elliot book but not all, you've filled in the blanks! I see scattered reports here and there of Houdini's card work throughout his life, both the manipulative kind and the close-up style. He was clearly proud and confident of his abilities. When Houdini first performed in Paris in 1901, audiences were still unfamiliar with handcuffs (they were not yet used widely in France), so he received few challenges. It's said his card work is what made him a hit in France. Dean--you can catch up to speed about the controversy surrounding Elliot's Last Legacy in Silverman's bio. John pointed out an interesting experience in Harry's early career. The card manipulations were Harry's go to thing in Paris 1901.